Give The God Questions Booklets to church visitors or to your friends and neighbors. 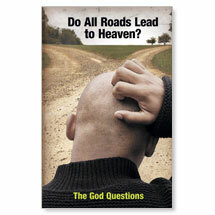 The God Questions Booklets – Do All Roads Lead to Heaven? God Questions Roads covers Christianity, Buddhism, Hinduism and Islam in a way that shows the compelling evidence and grace of the Christian faith. The final page includes a gospel message and prayer. 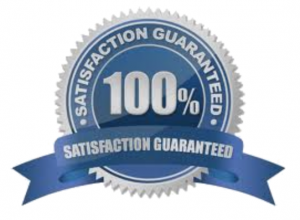 The God Questions Booklets – Is God Real? Help seekers explore two of the top questions about Christianity: is God real and is the Bible true. With its eye-catching graphics and evidence from science, archeology and history, The God Questions Truth outreach booklet makes an excellent evangelism tool or visitor gift. Empower your members to reach friends and family for Christ. 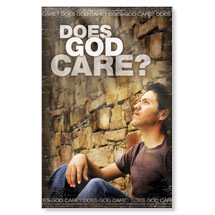 The God Questions Booklets – Does God Care? It’s the question in our hearts when things go wrong – when we’re abandoned, disappointed, hurt, when there is injustice in the world. Use this beautiful 8-page booklet to help seekers answer that poignant question. The Does God Care outreach booklet provides clear, Biblical examples of how God demonstrates His love for us. Includes an evangelistic message and sample prayer. This contemplative, thought-provoking design asks a universal question in a way that gets the attention of its viewers. 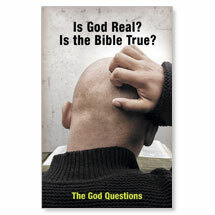 Order your God Questions booklets today!